Like Paul Magrs' other novel series featuring Brenda and Effie or Iris Wildthyme, Mrs Danby and Company - which also has the feel of the first in a series - takes its characters or situations from classic stories by other writers then gives them a different twist. This time three characters who seem rather familiar from Victorian adventure stories are thrown together a few years after their biggest triumphs, on a journey to New York in the early years of the 20th century: It's not hard to see who Mrs Danby, former housekeeper to a great detective, or vampire killer Abraham van Halfling could be based on, while Professor Zarathustra is every Jules Verne character in one. After an adventure on a sinking ocean liner and a voyage to an underwater city (including battle with the inevitable giant squid) the trio arrive to both unexpected celebrity, and more vampires in New York. In the usual crossover with his other series we get a brief insight into what all the fuss about Sheila Manchu's husband Mumu was, as he sends the characters into even more peril through a series of magical doors. 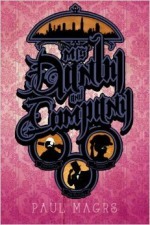 It doesn't quite have the campness of Magrs' other series but the fun touch in Mrs Danby and Company is that the narration switches between the three lead characters, giving us a view into how differently they all view their situations, and especially each other - the unstoppably arrogant Zarathustra unable to take a honking great hint about what the other two really think of his self-proclaimed greatness. It's a fun and funny bit of steampunk but it does seem as if Magrs keeps kicking similar off new series about adventurous old ladies rather than focusing on one.